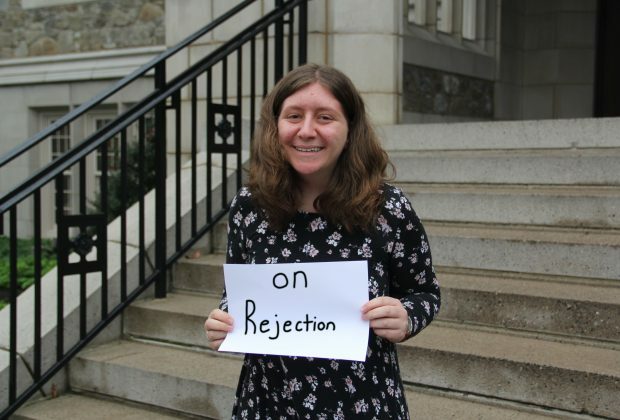 Authentic Eagles: Bianca Passero on Rejection | BANG. 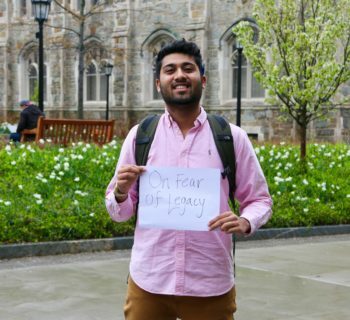 I came into Boston College as a wide-eyed, eager freshman. I was looking to get really involved in clubs and activities like I was back in high school. The involvement fair overwhelmed me as I got candy and pizza thrown at me and was asked incessantly if I sang or danced. Nevertheless I persisted through the fair, signed up for way too many clubs and eventually narrowed down the clubs I wanted to join. I knew I wanted to volunteer, and 4Boston appealed to me. But I had to fill out an application and interview. This seemed a ridiculous requirement for just wanting to help people, so I didn’t even apply. I joined some other clubs that didn’t require any applications and was content. I joined First Year Service Experience where I could volunteer four hours a week without an application. My placement was at a soup kitchen in Allston-Brighton and as hard as it was to see these struggling people and families come in for food, it was really fulfilling and let me escape the BC bubble at least once a week. I also joined CLC (formerly known as Cura) where I was in a small group that met once a week. We talked about our faith and how college was going so far for us. I joined the Pro-Life club, too, because that was a cause I was very passionate about in high school and wanted to continue here at BC. I enjoyed these clubs my first year, but I wanted some leadership positions because that was what I was used to in high school. It was also what I assumed I had to do in order to live the “perfect” BC experience. So I started the dreaded application process. A few seconds later, she asked me if I had too. I nervously waited for my inbox to refresh and when I saw that I had one new email my stomach turned inside out from nervousness and excitement. But then I read the dreaded words “Thank you so much for applying to be an Ignite leader. We had so many qualified candidates but unfortunately we are unable to invite you to be an Ignite leader at this time…” My heart sank. I texted my friend back congrats with a lot of exclamation points to show her that I was happy for her, even though I was heartbroken that I didn’t get it. It hurt to hear all of my friends who had applied for it tell me they were chosen and to be asked whether I had been too. It hurt to see them excited for team meetings. It hurt to hear about how awesome the team was and how they were so pumped for the retreat. It hurt to see all of the pictures on Facebook of all of the smiling faces from the retreat. I couldn’t help but think that I should have been there too. To make myself feel better, I told myself that it wasn’t meant to be and it was for the best since I was doing PULSE and student teaching. I would have been too busy anyway. I again was heartbroken, and this time I started to doubt myself. Was I not good enough? Were my problems not bad enough to give a powerful talk? Was I not retreat leader material? What was wrong with me? These thoughts flooded through my mind as I wondered why I kept getting rejected from positions I really wanted and was passionate about. The same thoughts plagued me again when I got rejected from being an RA. But I again fought all of these negative thoughts like I always did when they came up; I told myself that it must not have been meant to be and that I’m busy as it is. All of these negative feelings from being rejected came flooding back at the beginning of this year. My PULSE placement last year was The Campus School and I loved my time there. I was at first apprehensive working with these students since I didn’t know how to interact with them because they were all nonverbal. However, I quickly got to know the students and developed personal relationships with them all. One student and I would listen to Michael Bublé together. Another boy loved mysteries, so I would read him mystery books and we would work to solve them together. One girl was always asking me to talk about boys with her using her communication device. I grew close to these students, and they taught me the beauty of just being there for someone and that you don’t even need to have a conversation with someone to get to know them. I wanted to continue being involved there this year, so I applied to be a “buddy” for a Campus School student. I got the interview and thought it went well. I came away confident—a rarity for me. And yet I again got the dreaded email telling me how many other great applicants they had and how they unfortunately didn’t have a spot for me. Having volunteered at the Campus School for over a year, this rejection was especially disappointing. I was in shock. I thought my passion, experience, and excitement showed in my interview. I was so surprised by the rejection that I was convinced any minute now I would get another email about how the first email was a mistake and that I had in fact been selected to be a Campus School buddy. But that email never came. That night, while in the shower, I was alone with my thoughts, and they weren’t pretty. I started thinking about all the rejection I had experienced at BC. Everything came to the surface—even how many boys I have been rejected by. I felt after all this rejection that I must not be good enough, smart enough, kind enough, pretty enough, inspirational enough or just enough in general. I don’t belong here at BC, I thought. Everyone is better than I am, that much is evident. I’m never going to be able to compete with these people who are just so perfect and have everything going for them. I just give up. All these thoughts brought me back to some awful middle school memories. As the water of the shower continued to wash over me, I recalled 6th grade when my “best friend” ditched me because I wasn’t cool enough or pretty enough to be her friend anymore. I felt the self-hatred of my early adolescence come back. I thought about everything I hated about myself: my pimples, the way my face looks, my laugh that is too loud, my stutter, my big feet, my inability to talk to a cute guy without getting red like a tomato… The list just went on and on, and before I knew it, I was sobbing in the shower not knowing where to go from there. Once I finally composed myself as best I could, I told myself that I would study for my test that I had the next morning and if my roommate asked me why my eyes were red I would just tell her I got shampoo in my eyes. But the moment I got in the room I just broke down and told her everything I was feeling. And she listened to me and held me as I sobbed. She comforted me, and it felt good to get it all out. I wish I could tell you that one crying session with my roommate got rid of all of my self-hatred. I wish I could tell you everything is all rainbows and unicorns. I wish I could tell you I’m over all of the times I’ve been rejected and I now love myself! But that would just be a lie. Being at BC has been such a blessing in so many ways. I’ve met some of the most amazing people, been challenged academically, and learned so much in and out of the classroom. But BC has also been an unhealthy environment for me. Here at BC it seems as if everything is just perfect. My classmates are always smiling, the grass always looks brand new (because it probably is), and no one seems to have a care in the world. When I look around campus, I see all of these perfect looking people who are always smiling, have great grades, always have time to work out and eat healthy, have a busy social life, and have leadership positions in 13 clubs. And then I look at myself and think it’s no wonder why I have been rejected from everything I have applied for. I will never be as good as these people. I have been struggling with my self-esteem for many years now, and while club rejections haven’t helped, I am slowly learning to love myself and not let rejection define me. Whenever I have a negative thought about myself, I try to counter that thought with three things I love about myself. I’m trying to recognize that everyone on this campus is struggling and that their lives are not as perfect as they seem. I am constantly reminding my friends of their worth and value in the hopes that I may one day believe those words I speak to them. Those of you who follow me on Instagram know that I post an inspirational quote every Monday, and usually I post a quote that I need to read. I’ve come to know myself well and have learned that what sets off my negative thoughts is rejection. When I’m rejected from a club, by a guy I like, or from a friend group is when I feel like I’m not good enough, because if I was, that club would have wanted me or those people would want to hang out with me. Being on a high-stress campus has brought down my self-esteem, but I’m trying to stop comparing myself to others. I try to recognize that everyone has a different story. I have really good days, where I almost like myself, maybe even love myself. And then there are days when the self-hatred and negative thoughts are like a bully that I’m too weak to stand up to. I’m working toward the day when I’ll be strong enough and confident enough to squash the bullying of my own negative thoughts. But until then, I’ll keep telling people that they are beautiful, worthy, and loved, in the hopes that one day I believe it about myself too. I’ll try and come up with things I love about myself. And I’ll work on not letting all of the times I’ve been rejected define me because I don’t want it to. I want to be defined by my smile, my kindness, my love for life, my laugh that can be too loud at times but is always genuine, my good advice, the fact that every time I see a baby or small child I squeal with joy, and my passion for education. But I’m not there just yet.